It will keep your phone safe from water and dirt. Waterproof, Dustproof, Dirtproof, Snowproof. 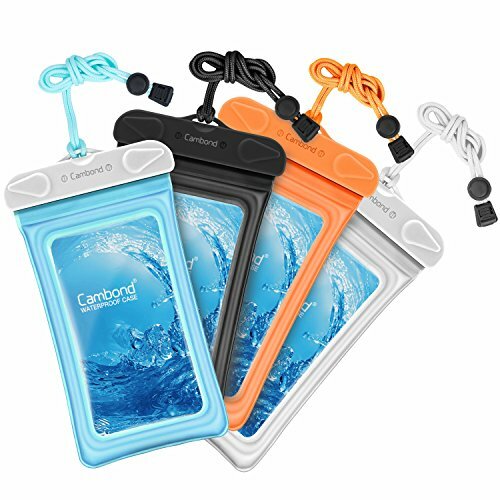 The versatile waterproof case comes in handy for going to beach, pool, lake, swimming, rafting, snowing, diving, drifting, skiing, fishing, boating, skating, surfing, kayaking, snorkeling and water park activities. Fits devices up to 100mm x 170mm (window dimensions: 80mm X 148mm). Compatible with phones devices 6 inch diagonal or less confidently. You can also throw in credit card, license, cash and a few small things. Compatible Devices: iPhone X 8 7 6s 6 Plus, iPhone X 8 7 6s 6, SE 5S 5C 5, iPhone 4s 4; Samsung galaxy note edge, S8, S7 Edge, S7, S6 Edge Plus, S6 Edge, S6 S5 S4 S3, Note 5 4 3; Google Pixel, Pixel XL, Nexus 5X, 6P; Oneplus 3T, 3, 2; LG V20 G3; HTC One M9 M8 A9 and smartphones up to 6.0" diagonal. 4. Keep it dry after each use.